Supermarket giant Sainsbury’s has revised plans for a Selly Oak regeneration scheme after five years spent trying to get the development off the ground. Planning consent for the 20-acre site was first granted to the supermarket chain in 2007 – but was soon hit by the economic climate and a developer could not be found. A planning application was then submitted in 2011 and faced opposition from the Lapal Canal Trust, which claimed the chain store was reneging on a deal to restore a section of the Dudley Lapal Canal which runs through the development. But plans have now been amended once more, following consultation with residents and local businesses, to include improvements to the canal and better road links. The site, off the new Aston Webb Boulevard, has been polluted by years of industrial and domestic landfill. 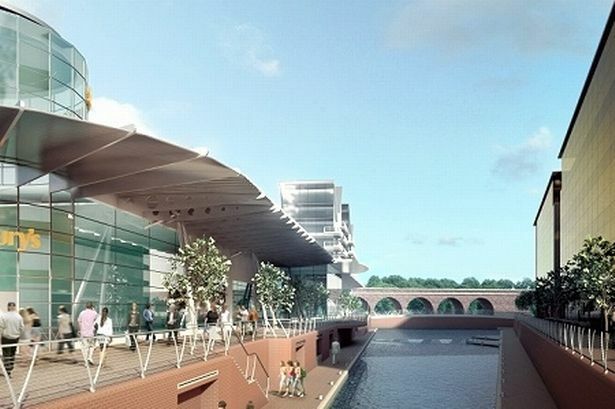 The plans would see the former Birmingham Battery and Metals site turned into a canalside development with a superstore, up to 20 shops, bars, restaurants, offices, a doctor’s surgery, student flats and hotels. Neil Carron, project director at Land Securities, which became a development partner for the scheme in 2011, said: “It is a gateway site for Birmingham. “Selly Oak is very important with the university and hospital here. At the moment the site is the missing piece in the puzzle. “Just to get to the plan outline you’re talking about spending £20 million in remediation. There isn’t any value in the site. It is a cost. The proposals are due before the Birmingham City Council’s planning committee on Thursday (June 21), following a site visit by councillors June 7. Concerns over a missing high-technology industrial park are set to be raised. The revised plan does include a building of up to nine storeys “that could be used for offices or research and development”. The report also states that if these uses are not viable the building could also be used as a secure residential unit. Local planning strategies and a market report suggest the area is more suited to a smaller number of low rise buildings for a cluster of businesses and organisations, rather than a single use nine-storey block proposed. Mr Carron added: “With the Lapal Canal link it has been difficult as you couldn’t put a canal through a shopping area. We’ve got a solution that we think will really capture the imagination. The developers hope the council will make a decision later this summer and if approved, would start cleaning up the site in 2013, with building starting the year after with the aim of opening in 2016. A new 100,000 sq ft Sainsbury’s supermarket would be the anchor store and would replace the nearby branch which is unable to expand as it is hemmed in on a triangular site surrounded by roads. Around 1,600 car park spaces would be set at ground level and underground and there would be two buildings for student accommodation for 400 people. A new extended waterfront area on the Worcester and Birmingham Canal will allow boats to turn and moor and a canal link will retrace part of the former Lapal Canal route, crossing the development through to Selly Oak Park. Developers claim the site will create around 3,000 jobs, 400 of which will be at Sainsbury’s. The development will include the road works on the Selly Oak New Road around the ‘triangle’ site and other road improvements in the vicinity. The development will be conditional on a £5.5 million section 106 agreement which will be agreed with the council and is likely to include improvements at the Bristol Road entrance, Bournbrook Recreation Ground and Selly Oak Library. In 2009 Sainsbury’s sparked fury when it demolished the historic 1871 Battery and Metals Building on the site because it had become “unsafe”. This was despite a pledge to retain it in the redevelopment. * Sainsbury’s has also unveiled proposals to turn the former GKN Driveline site on Old Walsall Road in Hamstead into a 30,665 sq ft supermarket and six business units ranging from 2,400 to 3,400 sq ft.
Plans for the empty industrial unit include around 300 car park spaces and new trees and landscaping. Sainsbury’s said the new supermarket will create around 200 jobs. Details of the scheme will be available at a public exhibition at St. Bernard’s Church, Broome Avenue, Great Barr from 12pm–3pm and 4pm–7pm on June 29 and 10am-2pm on June 30.